Here is a confession: I love classic old movies. Why? Well… The furniture…. I mean, they really knew their style back in the day, didn’t they? With the heavy wooden cabinets, wide dressers and enormous desks. Ahh, those beautiful desks… Nowadays, anything that is heavy wooded and large sized considered to be antique and extremely expensive. 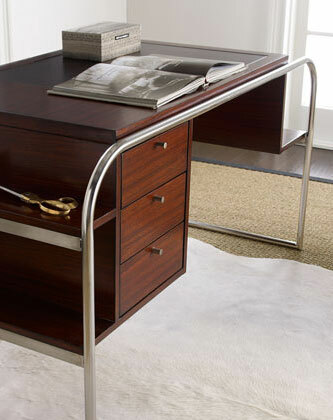 Ralph Lauren’s Laurel Drive Writing Desk & Chair is a sophisticated, elegant combination of old and new, with a unique design that allows the dignified look of the past to go along with a gentle, classical modern design. 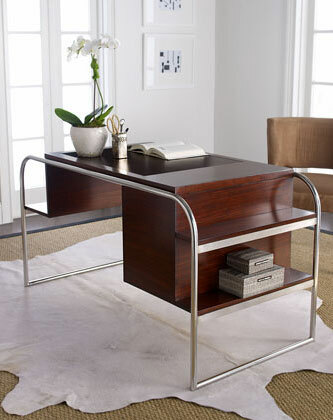 The hardwood desk has three drawers, a leather inset on top, and shelves on both ends; 56″W x 28″D x 30″T. It is very rare to see such perfect balance of old and new in one item, that also addresses all the efficiency one could ask from a desk. 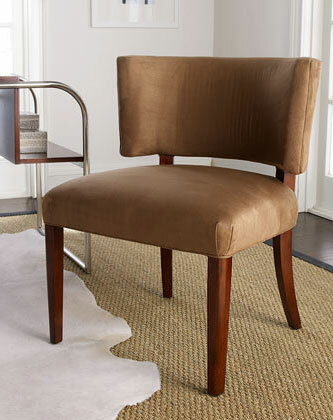 To complete the picture, the upholstered chair with its hardwood frame is also a unique piece; 26.5″W x 25″D x 32.75″T. The time is now, the feeling is of a bygone era. It could be that this is the contemporary ultimate design – old and new. Respect the past and use it in the present. This is a decorative item that will give your office or study room the look you’ve been looking for. As it doesn’t block the entire space, it still sends out a serious, efficient message. It is a place to work with a creative mind.